With a new Spider-Man movie coming out next year, it’s not a surprise that Marvel would get into the game early, putting out a ton of new collections featuring Spider-Man. What is a surprise, however, is that we would get this collection of David Michelinie and Todd McFarlane’s run prior to getting The Amazing Spider-Man Omnibus Volume 2, picking up where the first volume left off a few years ago, with the first Amazing Spider-Man issue penciled by John Romita Sr (the first volume’s last issue was Steve Ditko’s last issue on the book). That being said, I can’t say that I’m complaining, as this book collects Todd McFarlane’s famous run on Amazing Spider-Man, prior to his leaving the book to launch Spider-Man, which he would both write and illustrate. The impact and importance of this run can never be overstated, because Todd McFarlane single-handedly changed how future artists would depict not just Spider-Man himself, but also his webbing. Under McFarlane the webbing had character, and felt more realistic than it had ever before been illustrated as. 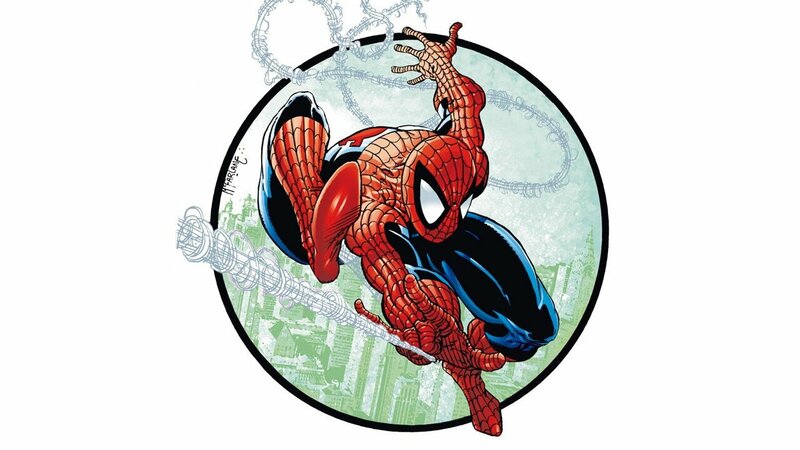 It used to essentially be Xs between two strands, but McFarlane’s webbing, dubbed “spaghetti webbing”, was something totally new and different, and definitely presented an artistic shake-up for Spider-Man. This is combined with his trying out some crazy poses for Spider-Man, as he emphasized the spider aspect of the titular character’s name. Prior artists had more or less shown Spider-Man swinging around like Tarzan, but under McFarlane, he became a much more nimble character visually. In many ways, that depiction was true to Steve Ditko’s perception of the character as created. This run has a variety of moments which are now considered as being “classic”, from Venom’s first appearance, to Harry Osborn putting on the Green Goblin suit during Inferno and battling the Hobgoblin, to Peter and MJ being evicted from their condo, Cosmic Spider-Man punching Grey Hulk into space and more! The last few issues of this collection boast artwork by McFarlane’s successor on the book, Erik Larsen, as we see Cosmic Spider-Man take on the menace of the Tri-Sentinel during Acts of Vengeance. Michelinie’s stories still hold up fairly well, and in some cases are very familiar, as current storylines in Spider-Man have similarities- Peter being brought in to a high-tech science think tank, getting his own lab, etc. This was only teased at in Michelinie’s run, with the character not taking the job as it meant leaving New York. Now in present-day stories, the same kind of opportunity presented itself for Peter, and now he’s living his dream job as a scientist by day, Spider-Man by night. It surprised me, upon reading through these stories, how sexually suggestive the scripts were at times, considering the time frame the book was released during. Some of the dialogue would be a bit risque now, so I’m surprised to see how prevalent it was twenty years ago, and in one of Marvel’s flagship books no less. The stories aren’t all winners, but Michelinie keeps the pace moving swiftly throughout, so if you do hit a snag in the storyline, it picks up again quickly enough that you quickly forget about it. As the continuity between the three Spider-Man titles wasn’t particularly tight, you never really felt that you were missing out on elements of the story, unlike later periods where the stories would often crisscross through the Spider-Man titles with near reckless abandon. The artwork is one of the biggest factors in selling this volume, and it’s well worth it. If you want to see why and how McFarlane truly became a superstar, you need look no further than this volume, as you can see the energy and excitement he brought to Amazing Spider-Man. What I took particular note of was the amount of detail laden in every panel, even in the backgrounds. One issue opens in a grocery store, and all of the carrots, etc, are visible in the panel, and they’re all drawn in. I’m often disappointed in modern artists who rely too heavily upon the colourist to spruce up the backgrounds, but I was in awe here of how much detail went into each and every panel it made. This is a fantastic collection, it’s well put-together, looks fantastic, and the stories still read quite well. There’s a nice flow to them, as Michelinie develops plot-lines slowly and organically, and you get a true reading experience from following the run through to its end, at least for now, until the next omnibus (hopefully) is released continuing Michelinie’s stories. Amazing Spider-Man is a fantastic collection, it's well put-together, looks fantastic, and the stories still read quite well.